Images from my visits in 2006 and 2008. Picture #3 in a series of 5. Some people are just drawn toward the sea and fishing. 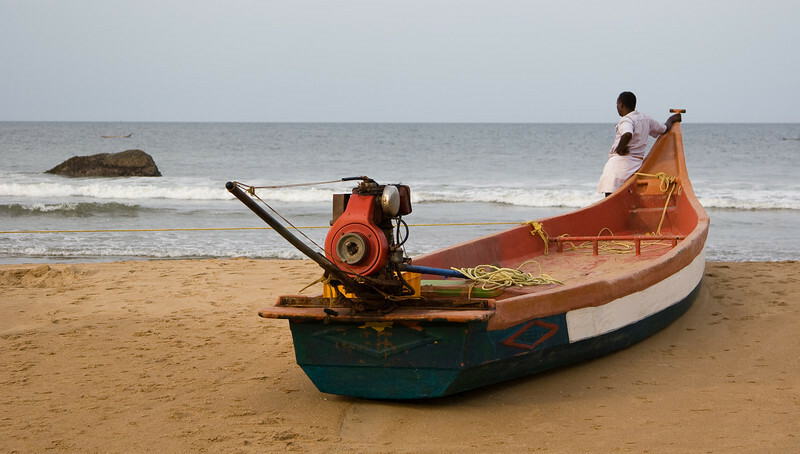 Here a man stands by a beached fishing boat and longingly eyes the Indian ocean. 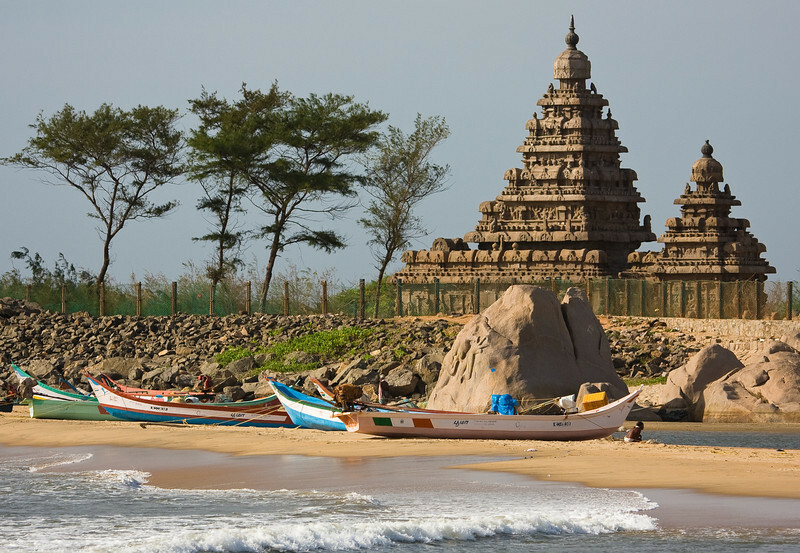 Locals' fishing boats moored on the beach with the fenced-off Shore Temple behind. 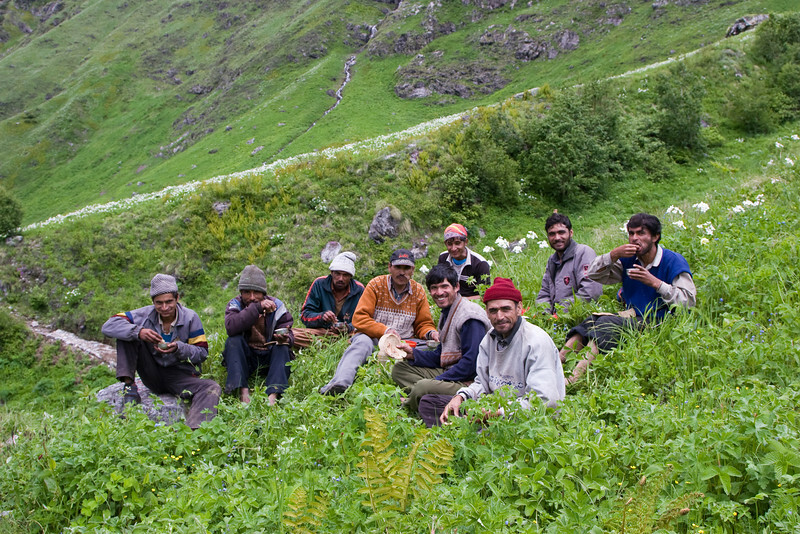 Trail crew taking a break. These guys were working to unearth and revitalize the over-grown walking path through the park. They offered me some of their chapati and though tempted, I declined thinking they'd need the energy more than I. 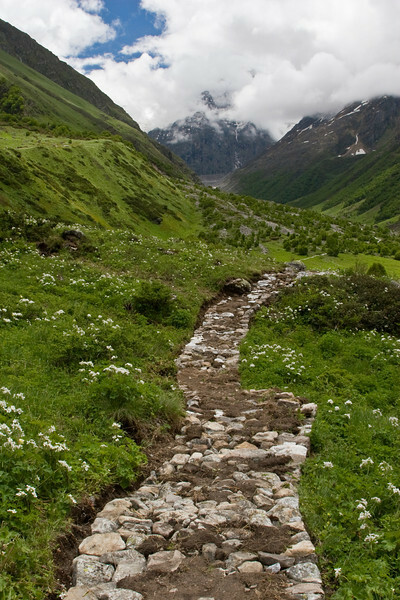 The freshly-rehabilitated walking path through the Valley of the Flowers National Park. Though there were some flowers out and blooming when I was there (mid-June), it was too early for the riotous display of color that the valley is named for. Some people I met were terribly disappointed in that there was "nothing to see". Me, I was enthralled for there WAS tons to enjoy and soak up if you just slowed down and took the time to look closely. So often the joy and delights of nature are not obvious - clearly many people aren't tuned in to this fact and they miss so much of what's around them. Location: Valley of the Flowers National Park, India. 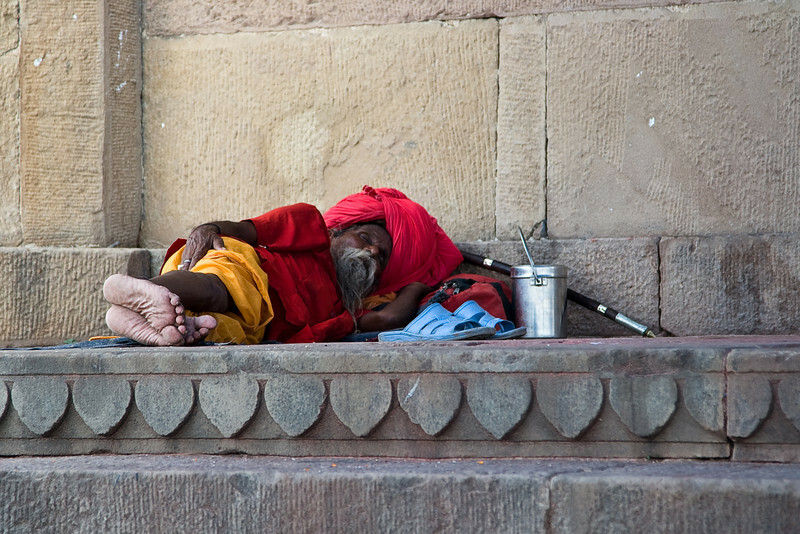 A Sadhu (a Hindu holy man) takes a nap out of the scorching mid-day sun. 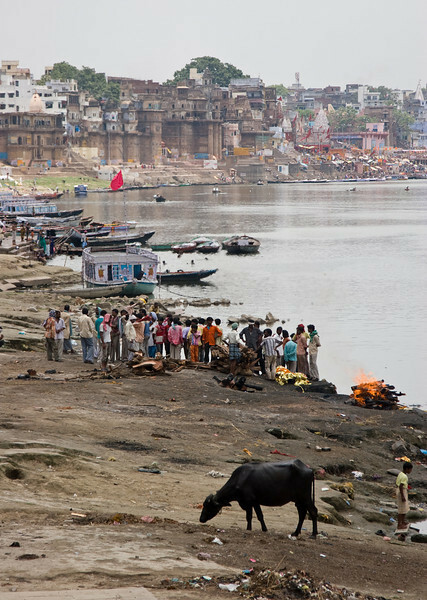 This is a photograph I snuck of one of the two 'burning ghats' in Varanasi - where cremations are performed. It isn't the famous one, unfortunately and although I went there and was given the tour and was allowed to watch a couple bodies ritually cremated, that one just had too many people around waiting for a foreigner to try to sneak in a shot (a great chance to extort tons of money from them). This one was much more open and less 'patrolled' - I just walked through and when I was far enough away to not have anyone watching me, I turned and fired off 3-4 shots. This was the best. I did get a couple boatmen out in the river yell at me, but they were a long way off - I ignored them. There are several things happening here - the roaring fire to the right is a cremation pile (yes, with a body inside). Moving left, the small gold-wrapped thing is a ritually-prepared body that the folks standing around are bargaining over the cost of wood to cremate (cremation is not a cheap affair - it's a very major expense for the family, especially if the deceased is to be cremated on the banks of the Ganges river - the most auspicious and holy place to be cremated in Hinduism). 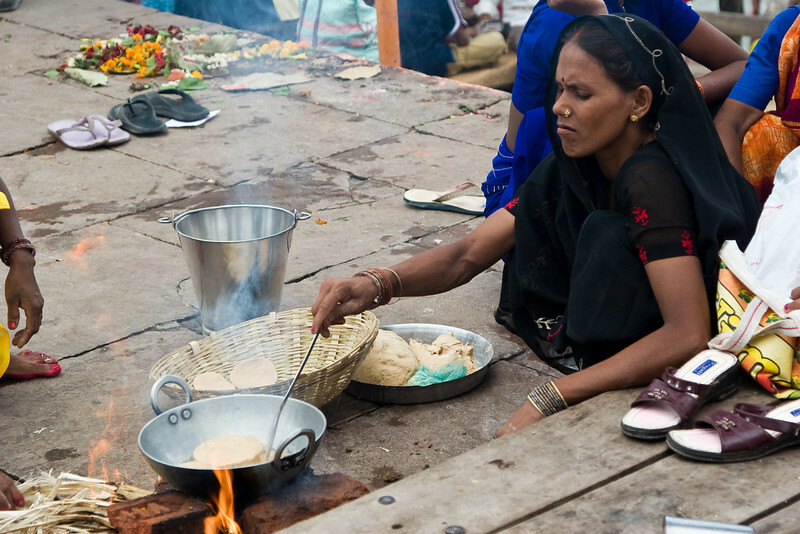 A peasant woman cooks lunch on the ghats in the baking-hot mid-day heat. 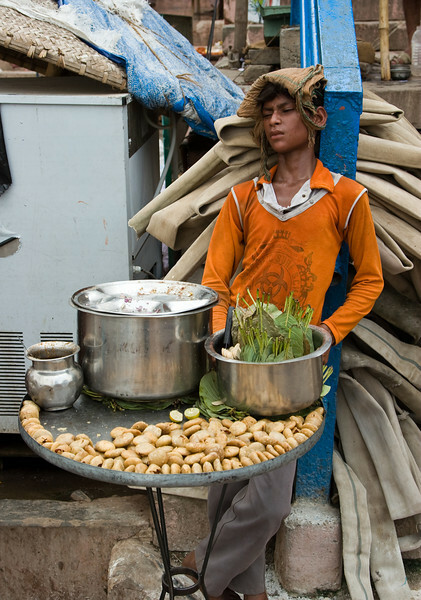 A snack vendor feeling the heat. Varanasi's 'ghats', or steps, are it's most famous attraction. Stretching for a couple miles or so along the holy Ganges river, they're a focal point for the city's inhabitants where all of life's activities, both sacred and mundane take place side-by-side. They'll come here to hang out with friends, bathe, wash clothes, commune with their gods, urinate, dispose of their trash and cremate their dead. For tourists like myself, to just walk along the ghats and soak it all in is a big draw in and of itself. As this picture shows, though just because something is revered or symbolized (like the Ganges river), it doesn't mean that it gets taken care of. 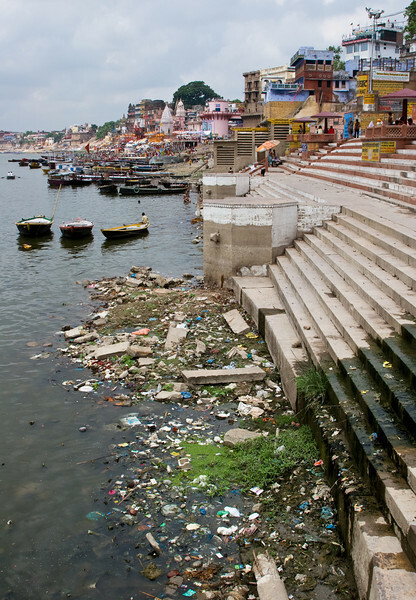 The Ganges is a heavily polluted waterway that is nearly devoid of animal life along this stretch. It stinks, too. 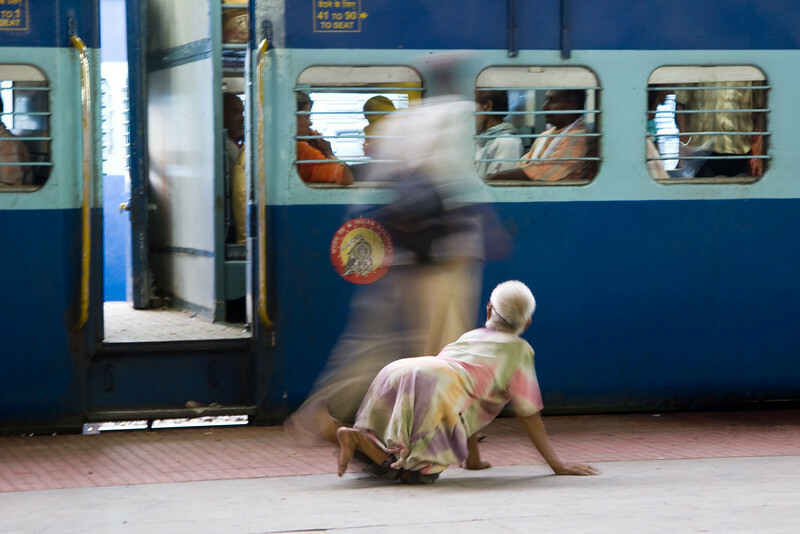 A woman crawls around a train station platform, begging. Though not a well focused or sharp photograph, I like the 'glimpse of real life'-aspect of it, especially the blurred passerby ignoring the beggar woman as she scopes out possible donors. 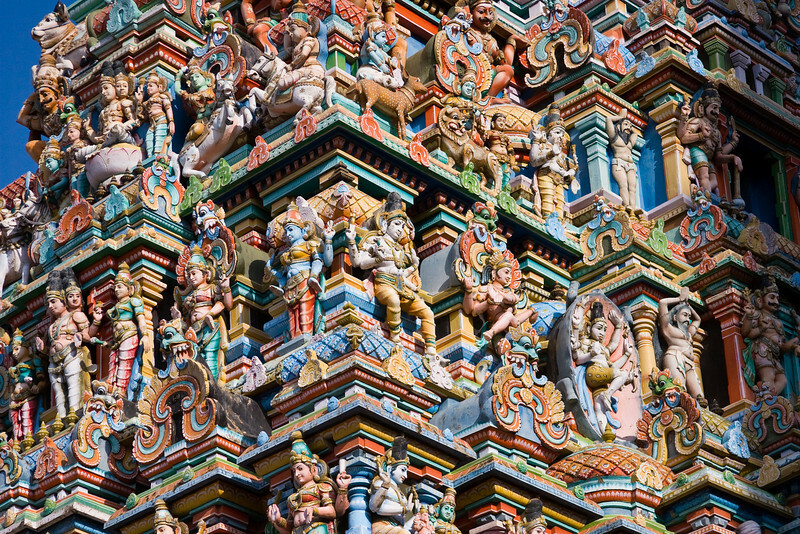 Detail of the remarkable 170 foot tall Hindu Meenakshi temple. Girlfriends walk down a town street. Taken from the third floor roof of my hotel. This shot is proof-positive that shooting RAW (instead of JPEG) is best - as it was a quick grab-the-camera-and-shoot moment, I didn't have time to check my camera settings before hand and I ended up drastically over-exposing the shot. I thought it lost for good, but as RAW files keep all the exposure information, I was able to restore it in Photoshop. If I'd shot JPEG, it would have been gone. Consider this advice for all the beginning digital photographers out there. All in all, I feel that it ended up a pretty nice image - I like the color, in particular. 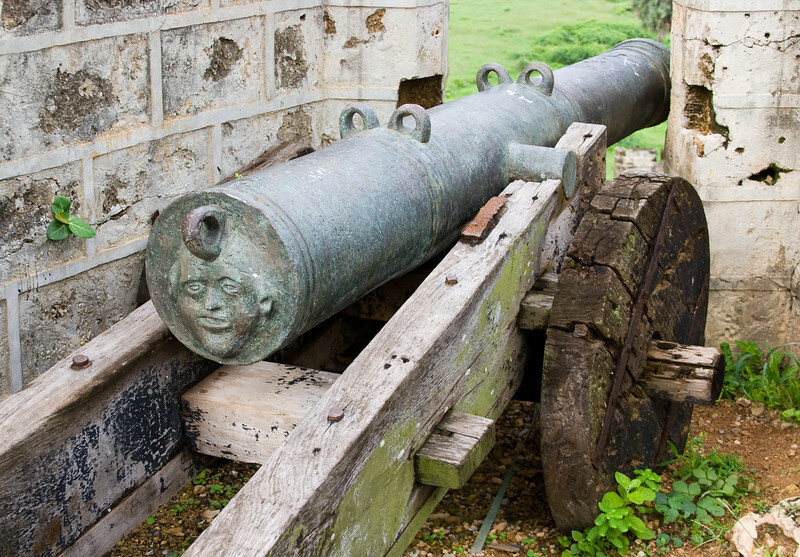 There were a bunch of near museum-quality cannons left in situ around the Portuguese fort. This one with its face was a personal favorite. 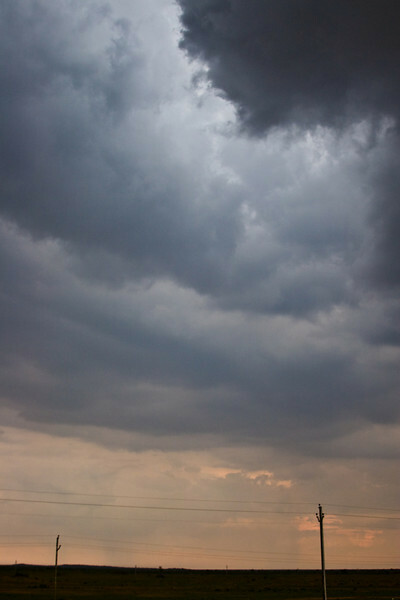 Monsoon clouds at dusk over the Rajasthan desert. 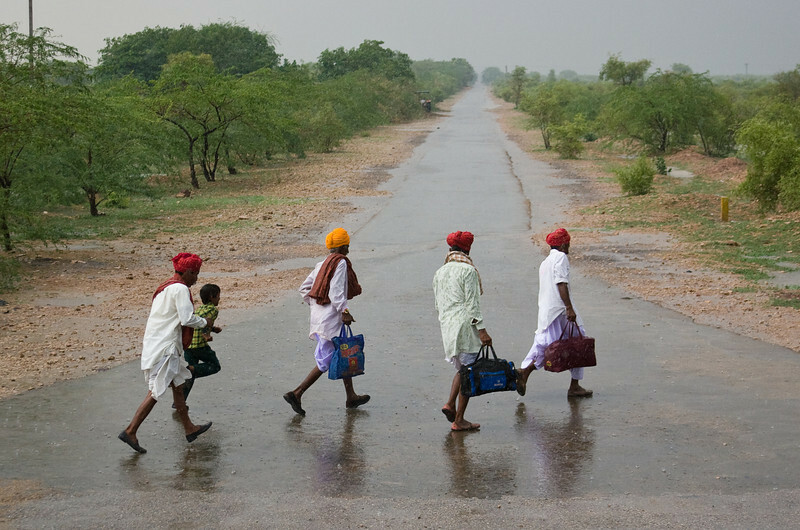 The monsoon rains drench four men that just disembarked the bus. I like the perspective on the road behind the men stretching off into the distance. 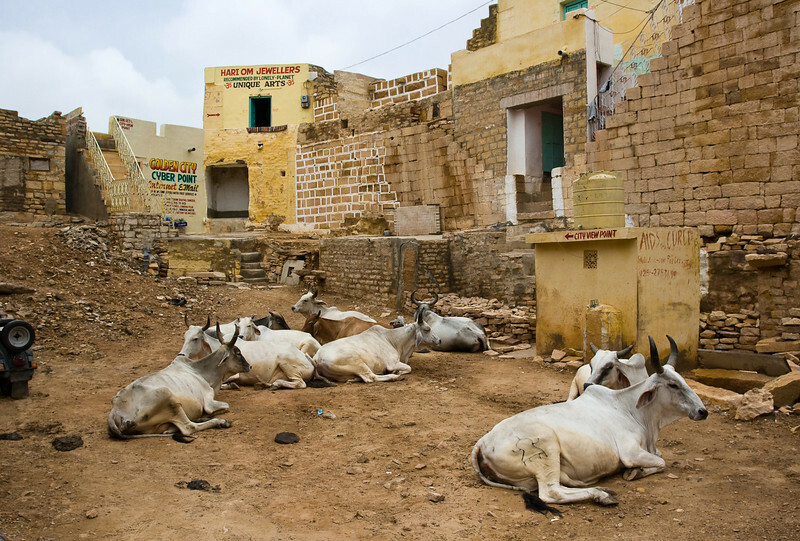 Inside the fort, a group of cows rests in a small square. This timeless scene mixes uncomfortably with the modern age - as the internet cafe sign and the 'AIDS Cured' graffiti on the right side water cistern attest. Image of a 'Tirthankara' (enlightened ascetic) from within the inner-sanctum of a Jain temple. In Jainism, a religion and belief-system that originated in India but has since spread around the world, every living soul is potentially divine. When the soul sheds its karmic bonds completely, it attains God-consciousness. It prescribes a path of non-violence to progress the soul to this ultimate goal. [excerpt from wikipedia] This belief is a concept much different than that found in Christianity, Islam and Judaism. 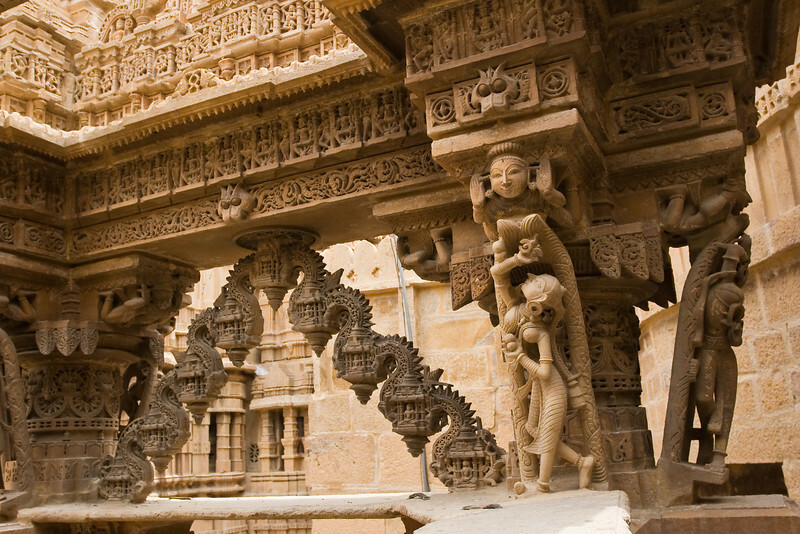 Jain temples in India are typically marked by extensive and amazingly intricate stone carvings. 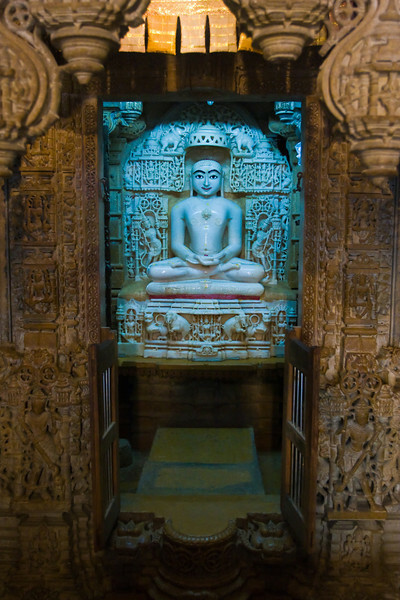 An nice example of the intricate stone carving found inside a Jain temple. 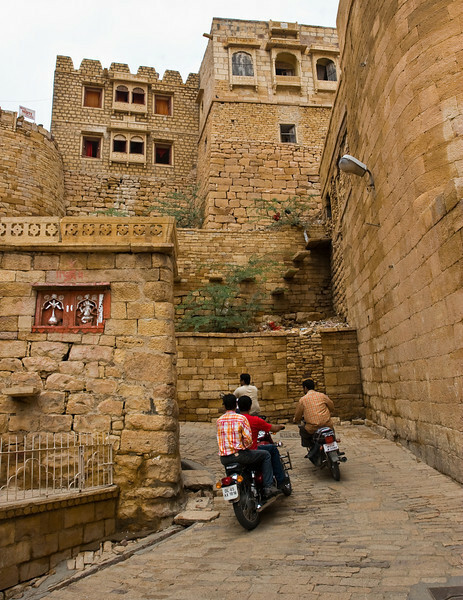 The fort of Jaisalmer is one of the most threatened ancient monuments in the world - far from a museum, it's a living entity with a significant population of people, animals and vehicles all trying to fit inside it and function in the modern world. The demands of water, electricity and sewage (or lack thereof), in addition to the severe Rajastani climate, are taking their toll on the structure - examples of its slow collapse and failure are visible as one wanders around it. 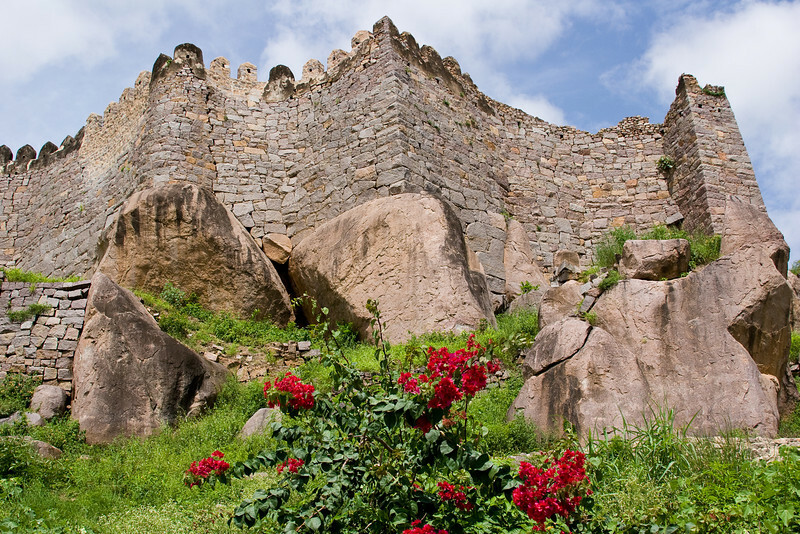 Here, men on motorbikes power their way up the twisty fort entrance road. 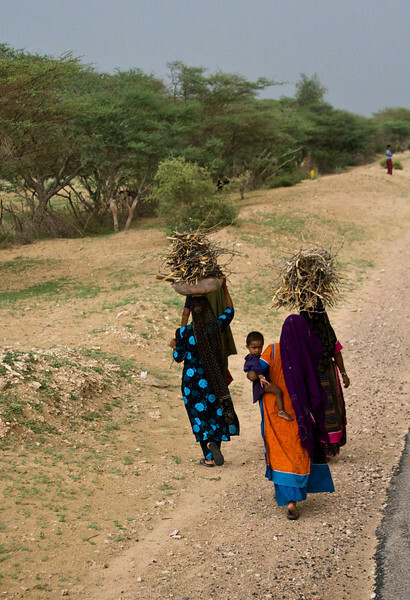 Women walk down the side of the road after collecting firewood. Scavenging firewood in this way is a major contributing factor to deforestation all across the world. Taken while sticking my head out the just-big-enough sliding window in my speeding, bouncy sleeping bus berth. 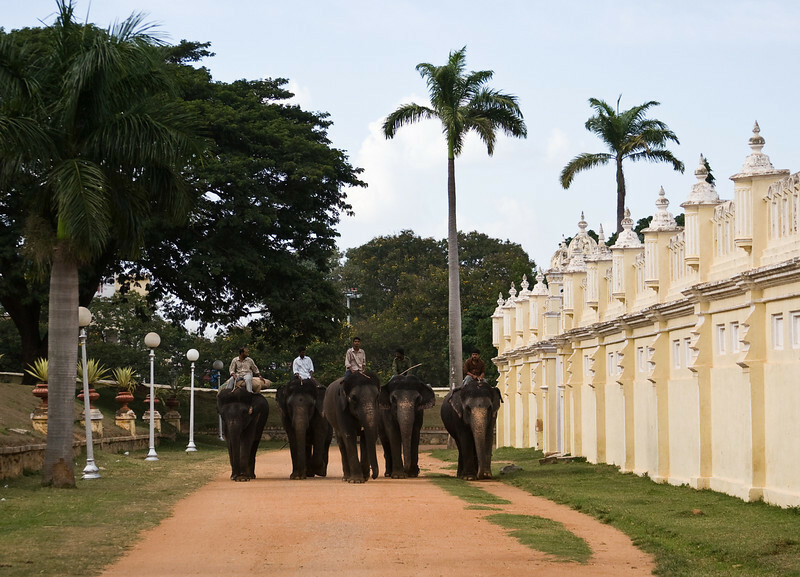 A small number of elephants getting ridden around the outer palace walls. They walked around the walls a few times while I was there, so I'm guessing the elephants were getting exercised. Despite my own expectations when I went to India, elephants are not that common - you won't see them that frequently. During the three trips I've taken to India, I've probably only seen elephants four or five times: these here, once or twice while in national parks, once in the south carrying logs and once in downtown Delhi late at night walking down the main backpacker/cheap hotel road (and no, that one wasn't a pink elephant). 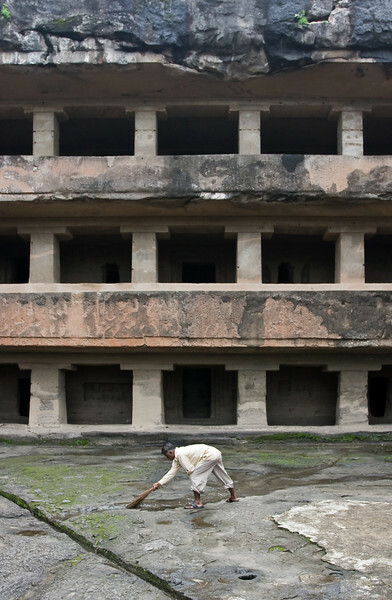 Man sweeping up debris and trying to drain accumulated rain water in front of an abandoned temple. 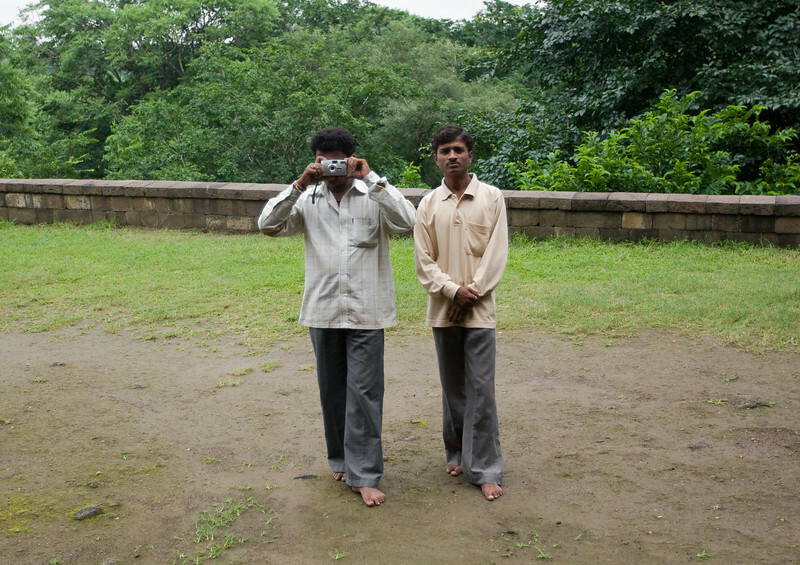 Many Indians find photos of foreign tourists a great souvenir. Some folks like having their pictures taken. Me, I hate it - I usually deny their requests. That is if they even ask. Sometimes, however saying no doesn't put them off. Like this time. I thought I could shame them by taking their picture while they took mine. They weren't even fazed. A group of friends taking a break on the hike up to the top of the abandoned fortress/city of Daulatabad. The guy on the right is either not enjoying himself or doesn't appreciate my taking his picture. 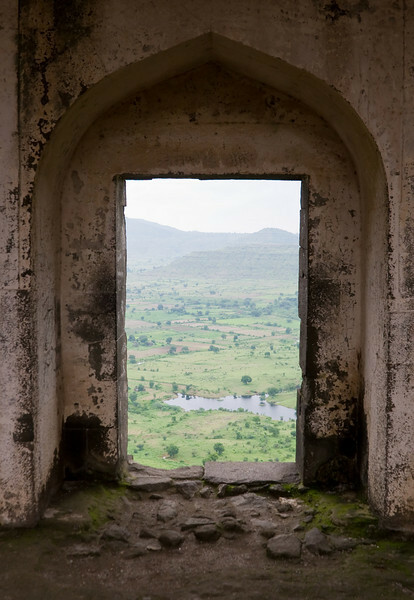 The central Indian countryside as seen through a doorway in an abandoned palace. The arched, cupola-shape is extremely common in Indian architecture and is found throughout old buildings and monuments of differing ethnic groups and time periods across the country. 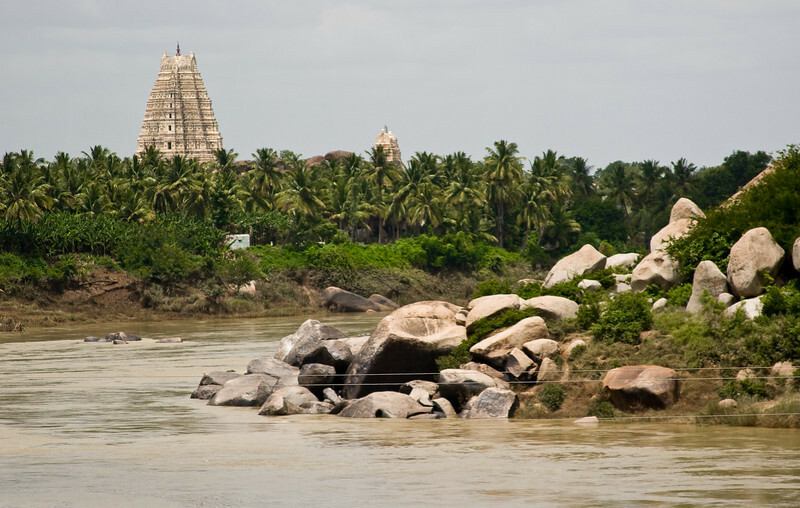 The main temple rises well above the surrounding palm groves. Shame about the powerlines - I tried clone stamping them out, but never could come up with a satisfactory result so I just gritted my teeth and left them in.